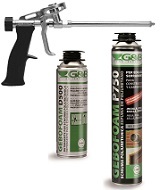 • Polyurethane foam for professional gun. • High sound and Heat insulation. • High impermeable and adhesive features. • Resistance to UV rays: scant. • Application temperature from + 5° C to + 40° C.
• Surface cover approx. 12’. • Cutting ability approx. 60’. • Density (after restricted expansion) 20 - 22 kg/m3. • Service temperature from - 40° C to + 120° C.
• Fire rated class DIN 4102: B2. • PDR label on cartridge. which dissolves completely the fresh foam. sprayed directly into fresh foam to dissolve it. Not effective on hardened foam.